It is not uncommon for an employee to be paid a consistent salary with the opportunity to earn a bonus. The bonus can often vary from nothing to quite significant. In such cases, it makes sense to get a dollar-expressed order from the base salary so the payor knows what is being paid and the payee knows how much to expect to receive. It also makes sense for the bonus to be a percentage-expressed order as it can vary greatly. Yet, Wis. Stats. §767.34(2)(am)3 prohibits such a mixed order. This is just silly. There is no good reason for this rule and, fortunately, Tierney now allows mixed orders. That led to me thinking … what other family law rules are simply silly? 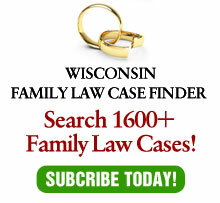 While as a general rule, we can be proud of the quality of Wisconsin’s family law jurisprudence, we can also acknowledge that it contains a few rules that should be revisited. As anyone familiar with this column knows, one silly rule, in my opinion, is the prohibition against caps on child support, even if two intelligent, informed adults believe that such a cap would not only be in their best interests, but best for their children. Instead, Wisconsin courts prohibit such stipulations as they apparently do not see the greater harm caused to children by their parents fighting. Several Wisconsin cases, most prominently Frisch v. Henrichs, 2007 WI 102, 304 Wis.2d 1, 736 N.W. 2d 85 have held, amazingly, that an agreement which protects children is against public policy. Actually, this is not just silly – it’s sad. Another silly rule is that premarital agreements affecting property division are binding on the court at the time of divorce (unless they are inequitable), since they were made in contemplation of an ongoing marriage. Yet, agreements made in contemplation of a divorce are not binding on the court. See Van Boxtel v. Van Boxtel, 2001 WI 40, 242 Wis. 2d 474, 625 N.W. 2d 284. Yes, that’s right. An agreement made when the parties are thinking of their marriage, are not planning on getting divorce and do not know their financial circumstances if a divorce occurs are binding. But an agreement made when the parties are planning on getting divorced and know their circumstances are not binding. This is, simply, backwards. But, perhaps the worst rule in this field of law is the prohibition against contingent custody and placement orders. In Culligan v. Cindric, 2003 WI App 180, 266 Wis. 2d 534, 669 N.W.2d 175, the Court of Appeals held that the portion of a divorce judgment which contemplated a prospective change in placement is invalid. The appellate court held that trial courts lack the statutory authority to order a change of placement that is prospective and contingent on the occurrence of some anticipated event. The need for such authority is most common in cases where at the time of the initial order a child is under school age and the parents live in different geographic areas. The preferable means to resolve such cases is for an agreement reflecting the current circumstances and the intent of the parties for placement when the child starts school full time. Either parent can return to court prior to that date if circumstances change, but the default setting is in place if there are no substantial changes. Such an agreement would set the stage for avoiding litigation in the future. Amazingly, instead of discouraging litigation, the Court of Appeals decision in Culligan requires it. Similar to the prohibition against caps on child support, I wonders if the appellate courts have any appreciation of the toll on children of their parents fighting. Finally, although not limited to family law, no column of mine critiquing Wisconsin law can be complete without one more swipe at the idiotic rule prohibiting citations to unpublished Court of Appeals decisions. This rule was eased a bit by the enactment of Wis. Stats. §809.23 (3)(b), which allows citation for persuasive value only of authored Court of Appeals decisions issued on or after July 1, 2009. While amazingly enough, the world did not come to an end with this limited ability to cite unpublished opinions, it does not go far enough. It boggles the mind that while we can cite trial court decisions, we cannot remind the court of appeals of their own decisions. Thankfully, it appears that the Court of Appeals in Tierney has removed one silly rule. Now, how about getting to work on the rest of them?